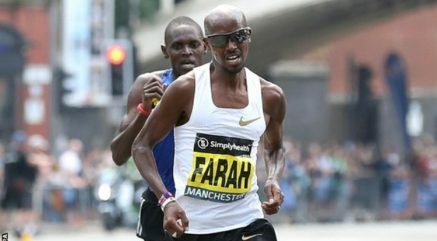 20th May 2018 – Sir Mo Farah (GBR) showed that despite now having switched to the marathon he still possesses devastating finishing speed as he outkicked fellow PACE athlete Moses Kipsiro (UGA) in the final 150m of the Great Manchester Run. In the hot conditions it was the PACE duo plus former World Marathon Champion Abel Kirui (KEN) who soon broke clear from the field. After passing halfway in 14:15 Kipsiro continued to the lead and keep the pace honest. Kirui was dropped by 7km leaving Mo and Moses to run for stride for stride until Mo launched his trademark finish to take the win. Mo clocked 28:27 with Kipsiro just one second in arrears. On the track, Olympic Champion Matthew Centrowitz (USA) warmed up for next weekends Prefontaine Classic with a competitive training session at Occidental meet in California. Matthew ran 1:48.41 in the 800m and followed this up with 3:38.99 for 1500m within the hour. Laura Roesler (USA) ran 2:03.46 for 800m at the same meeting. Shamier Little (USA) ran at the Boston Boost Games over the unusual distance of 200m hurdles but took second place in 25.90 seconds. At the IAAF World Challenge in Kingston, several PACE one lap specialists were in action. Bralon Taplin (GRN) took third in the men’s 400m just one spot ahead of Matthew Hudson-Smith (GBR) clocking 45.41 seconds to 45.70 seconds respectively. Over the hurdles Jaheel Hyde (JAM) was fifth in the men’s event and Ristananna Tracey (JAM) sixth in the women’s. Finally at the annual Night of the 10,000m PB’s which this year also incorporated the European 10,000m Cup, Chris Thompson (GBR) finished seventh in 27:52.56.